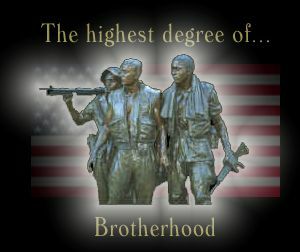 You are about to embark on the highest degree of brotherhood. As you leave our great country today, know that you take the hearts of most of America with you. I have never been prouder of our military troops than I am right now. The television has my attention as I look to it each day for the news that will tell us you will all be home soon.... But soon doesn't come fast enough to stop the journey that will one day be a part of your past. Words cannot express the emotion that spills forth as we all watch in disbelief, one THOUSAND paratroopers fall from the sky, ready to fight for the safety and freedom of others. We are in awe at the droves of American tanks forging ahead in the dust of the desert, to fulfill a commitment to liberty and justice for all. 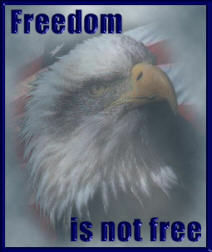 You know like no others, that freedom isn't free~ you were trained to pay the price. Go forth and make history soldier, like you will never again be placed in a position to do. Although you've heard the slurs of some of the most disrespectful people in our nation... forget about them~ You're a SOLDIER. March on! Be proud. 100,000 troops will be joining you soon... and These Colors Won't Run! My daughter "Heather" was in military training school (AIT) and my son-in-law "Ken" had orders to go to Iraq. I was called upon to go from Texas to Virginia where they were stationed, to care for the grandkids for one month while Heather completed her training. Ken is a Chief (CW3) and some of the young men in Ken's unit received orders to Iraq right after Heather finished AIT school and was back home. I had returned home to Texas when I received a call from her asking for idea's for a small token gift to give these young men before they left the United States. She felt bad for these young soldiers, some of whom had no one to bid them farewell , as they were far away from home. It was during the time the military tanks were heading straight into Baghdad. I could hardly leave the television as I watched in disbelief while American soldiers carried on with their orders. When Heather asked for thoughts on a token gift for the young men who had just received their orders, the inspiration to write this was born. I instructed her to buy some red, white and blue ribbons, a package of printing paper and leave the rest to me. 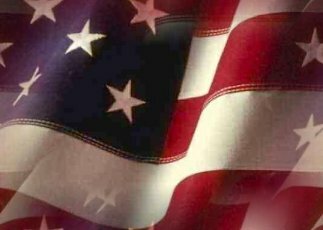 I sat down at the computer and looked for some patriotic graphics. That's when I found Doc's website of Military & Patriotic Graphics. As I chose the graphics, the words began to flow. When I was finished, I placed the graphics where they belonged and sent it on to Heather via e-mail. She did as instructed and printed out the 14 or so copies, rolled them up and tied them closed with the red, white and blue ribbons. She hurried on to the gym on Post where they were having a farewell gathering for the various troops. She located Ken's unit and distributed this token to each of them. It was too late when I realized I hadn't penned myself as author. Maybe someday these soldiers will find this page and be taken back to that day ... just before their whole life changed. I hope they can smile ... I hope they made it home.